Researchers from the Massachusetts Institute of Technology have created an amazing material that could revolutionize the way we build things in the future. A team of researchers from the Massachusetts Institute of Technology and the Singapore University of Technology and Design has developed new 3D printed structures that can “remember” their shapes, bouncing back to their original form even after being subjected to extreme stress. Scientists believe the new discovery could lead to advances in fields including solar cell and drug delivery technology. 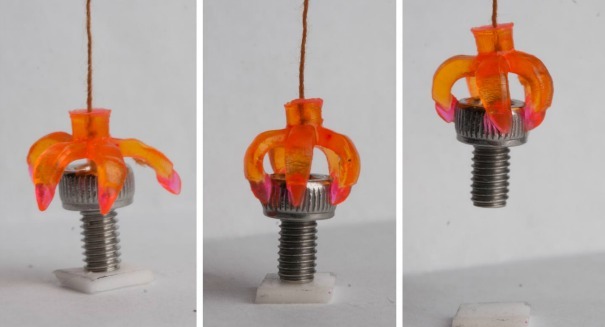 Researchers developed a method for printing structures that would bounce back to their original shapes after being bent, stretched and twisted into coils, flowers, and even a small replica of the Eiffel tower in seconds. The team, lead by Nicholas X. Fang, associate professor of mechanical engineering at MIT, created the shape-memory polymers on a micron scale – the material’s features can be as small as the diameter of a human hair. The scientists say that the materials can predictably change form in response to shifts in temperature, and hope to apply this property for making solar panels more responsive to the sun’s movements and even creating a drug delivery system that responds to early signs of infection.